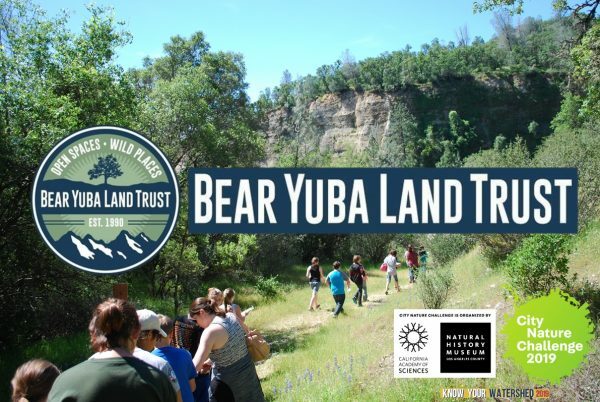 You are invited to participate in Bear Yuba Land Trust’s 2019 Community BioBlitz! During the BioBlitz, community members will visit Rice’s Crossing North Preserve to develop scientific skills such as observing, recording data and identifying different plants, animal and fungi species to capture a biological snapshot of the land. Observations can be made by journaling in a field notebook, which will be provided, or by taking photographs with a smartphone or digital camera of all the organisms found on the preserve; this visual data will be uploaded to the iNaturalist database. These observations will help maintain a permanent record to help BYLT land managers track the health of the ecosystem over time. Additionally, experts will be available to assist with species identification- come learn more about plants, fungi, animals, butterflies, bees and birds in the expert interpretation area! Directions to Rice’s North Preserve: From Nevada City, take Highway 49 towards Camptonville, turn left on Marysville Road and cross over the Bullards Bar Dam. Rice’s Crossing Preserve is located 1.3 miles from the dam. Park in the rock quarry on the right and cross the road to the North Meadow where you will find the Yuba Rim Trailhead.